Put the stopper behind the door, prevent the door from opening against the wall to make noise or damage the wall. Decorative furnishings, cute shape is very suitable to decorate their own space. MULTI-FUNCTION: In addition to being used as a door stopper, this door stopper is also recommended to use as desktop and car decoration. SIZE: 5" x 3.5" x 2"
Just wipe the surface with a damp cloth. The door stopper is a light duty doorstopper and may have less effect on heavy doors. 1 mouse door stopper, 1 paper bookmark. ❤️ It serves its purpose and makes everyone smile, cute face, head turns, bright eyes and leather leashes with pendant. 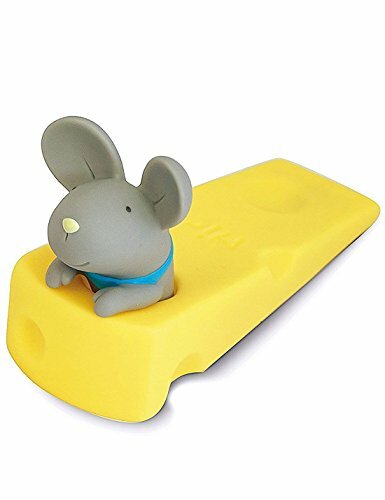 ❤️ Cute door stopper is absolutely adorable, place on a corner of desk, bring you smile, especially if you are a pet owner! ❤️ Anti-slip wedge bottom holds the door steadily and prevents it from sudden slamming, help protect hardwood from scratches and dents. ❤️ Size: 5" x 3.5" x 2", they can hold doors with clearances from 0.75" to 1", and it's not heavy enough to stop heavy door. ❤️ What you extra get: a mini box opener, 100% money back guarantee, lifetime worry-free warranty and friendly customer service.